Most people might find it unseemly were you to run background checks on your potential dates prior to asking them out. But the same does not hold true when hiring a new employee. While taking a chance on a blind date might result in a bad evening, there’s absolutely no doubt that making a wrong hiring decision can haunt your company, other employees, and/or your client base. 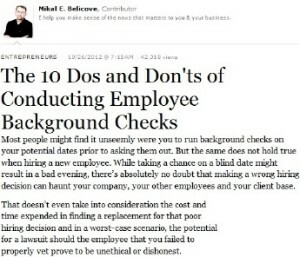 That doesn’t even take into consideration the cost and time expended in finding a replacement for that poor hiring decision, and in a worst-case scenario, the potential for a negligent hiring lawsuit should the employee that you failed to properly vet prove to be unethical or dishonest or more. The recent federal budget shutdown and lower unemployment forecasts are among things that many employers would not want to take chances with. In a time when business firms find themselves wanting to get back on track after a rough patch, a promising candidate who turns out to be a poor hire is the last thing they need. As such, companies see the need for effective and timely employment background screening experts, like The Accu-Facts Company, to provide them with the necessary intelligence and validations about a potential candidate’s compatibility with them. 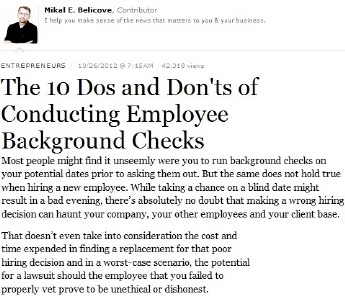 Employment background checks are meant to go beyond simply studying each applicant’s resume and supporting papers. Bellicove said a screening team on the case will cast a wider net to gather more information, such as criminal conviction records, verifying the candidates driving history, confirming past experiences with former employers and even the level of social media activity. No one item, or background screening task, should take precedence lest the company be accused of violating federal equal-opportunity regulations. As such, an employment screener will use the same research methods across the board for all candidates and every job opening. Remember, the employer must have FCRA compliant Release Forms, signed by every candidate. Direct communication with the applicant is encouraged if there are misconceptions that must be resolved or other data re-confirmed. It is ideal that candidates come clean about their personal history voluntarily, at the pre-employment screening stage of the hiring process. But in case that does not seem likely with a particular candidate, a professional employment screening service, like The Accu-Facts Company, can help your human resources department achieve that goal anyway with a timely, accurate and comprehensive background screening assignment.